VMJ, VMC, VMD, VMP, VMCJ, VMFP, VMAQ, VMU, VMO & VMFA (AW) with ATARS. The core of our current roster is made up of former members of the VMCJ squadrons. The picture of the 4 VMCJ-2 aircraft in formation on the splash page is a tribute to all who served with the 3 VMCJ s from 1955 until the last colors were retired in 1975 by VMCJ-1. 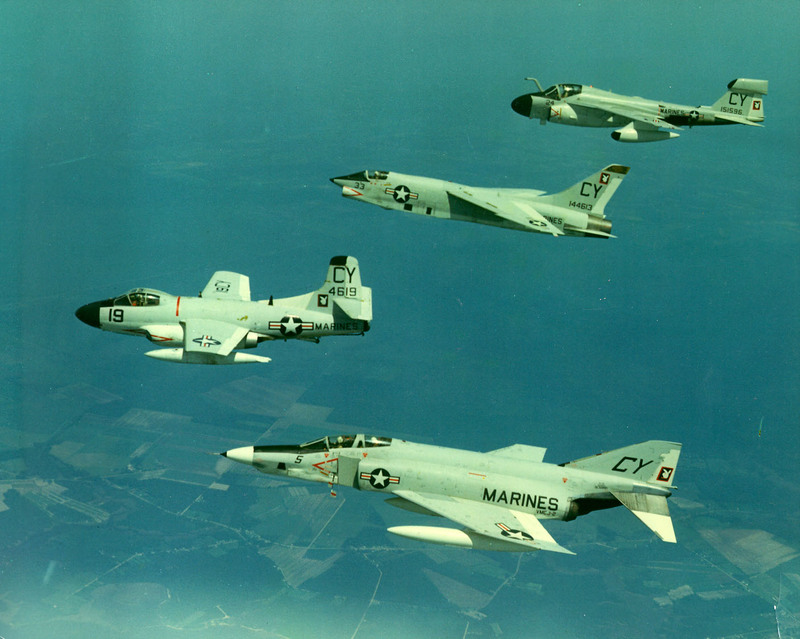 The photo depicts a major aircraft transition in 1965-66 as the squadrons moved from the RF-8A and EF-10B to the RF-4B and EA-6A. However, it should be noted that the EF-10Bs served in Vietnam until late 1969 and were retired from VMCJ-3 in 1970. During the 1980s Marine Tactical Electronic Warfare Squadron Two (VMAQ-2) (formerly VMCJ-2 ), hosted informal reunions featuring Pig Pulls at MCAS Cherry Point, N.C. In 1988, Hoyt Wayne Young and Don Grant, in conjunction with Fed EX. Inc. organized a reunion of the officers and men that were associated with Marine Composite Reconnaissance Squadron One (VMCJ-1) in Vietnam. This event, held in Memphis, TN, was so enjoyed that it was determined to meet again in two years in St. Petersburg, FL. It was during the second formal reunion in May of 1990 that a group of VMC, VMJ & VMCJ veterans discussed the feasibility of establishing a membership organization. Among this group were Smokey Lockhart, Fred Killebrew, Paul (Tojo) Wheeler, Marty LaChow, Snake Lewis, Sam Figueroa, and Mickey Conroy. In June of 1990, Rush Morgan (CWO USMC (Ret. ), who was instrumental in putting the St. Petersburg reunion together, proposed the establishment of the Aviation Reconnaissance Association. Rush Morgan is recognized as being the founder of the MCARA, Inc. This organization was to embrace all of the past and present Marine Corps squadrons involved in intelligence gathering and electronic warfare. Morgan enlisted the assistance of Fred Killebrew, James T. Smith, Mickey Conroy, H.L.Walter and Barney Miller in this endeavor. On 26 September 1990, the Marine Corps Aviation Reconnaissance Association was incorporated by the Florida Secretary of State. The first officers were elected and took office on the 1st of November 1990. They were: Lt. General John Hudson, USMC (Ret), President, Major Mickey Conroy, USMC (Ret), VP, Major James T. Smith (USMC (Ret), secretary, and CWO Rush Morgan (USMC (Ret) treasurer. A Twelve member Board of Directors was appointed with Fred Killebrew as Chairman. Biannual reunions have been held around the United States since 1988.